I wanted to make this post last week, so it’s a bit overdue. It was the final week of the program and I was not looking forward to making this post because I would have to yet again recognize that it was really the final week. We gave our last goodbyes to the host families and danced with them during a musical performance. Although my Arabic course was difficult for me because I feel that there wasn’t enough practice with the material, as it felt like new things were piling on top of new things that we had to learn, I really liked my teacher and the fact that there were only 2 students including me, so it made the learning environment much more tailored to our individual needs. Also, throughout last week and a few days during the prior week, each of us worked with a Moroccan student on a paper that had to be all in Arabic. I chose my topic on Moroccan culture where I talked about traditional food, clothing and language of the country. It was great working with the Moroccan students not only because they helped us with the Arabic papers and presentations, but also because they became our friends. 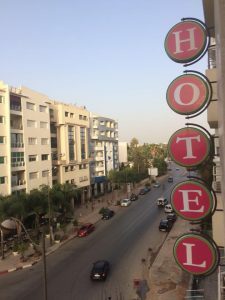 Another thing, one of many things that I appreciate about the culture here (of course not exclusive to Morocco) is the hospitality of for the lack of a better word, strangers, or at least I feel like one. I will remember all the families that I have been invited to stay with despite the fact that they didn’t really know me. 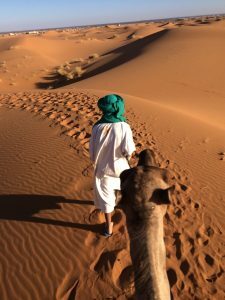 Anyway, these last 2 weeks of my stay here have been bittersweet because I am definitely leaving a piece of my heart here in Morocco, something that I was not expecting. Over time, some of my experiences here became mundane, especially by being caught up with the academics of it, that I forgot I wasn’t going to stay here for much longer. Now that I have to leave tomorrow, I wish that I had more time to explore the country. I spent this weekend in Marrakech with my group. We took a 6 hour-long train ride to Marrakech from Rabat. We got there at night and split into different taxis to get to our hostels. Unfortunately, but unsurprisingly, we were ripped off by the drivers because we were clearly tourists. During our trip, I mostly remember how extremely hot it was there, but other than that, it was fun to check out the famous Jemaa el Fna, a public square, even though it seemed much smaller than the pictures I’ve seen of it on the internet. We of course tried the orange juice there, which is a must-do if you’re visiting, and it was fresh and delicious, though not different than any other fresh orange elsewhere in Morocco. That’s something I will miss about Morocco. The orange juice here is naturally sweet and very refreshing, so I order it most of the time when I go to a café or restaurant. It was fun walking around the square and shopping around, but there were a lot more vendors trying to stop us and sell us things. 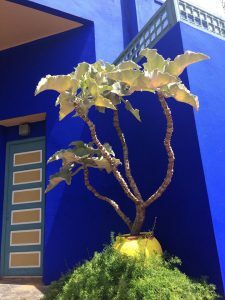 On Sunday before heading back to Rabat, we visited the Jardin Majorelle, one of the top tourist destinations in Morocco. It was very beautiful and I loved the contrast of color there. I have never appreciated vibrant dark blue and vibrant yellow together as much as I did at the garden. As I walked around by myself, I noticed that there were significantly more Russian speakers there and around the square in Marrakech than I’ve noticed in any other city in Morocco, and I was really surprised by that. I also had a brief conversation with a shop owner about how apparently, there’s quite a few Moroccan students who study in Ukraine! However, most of them go to Western Europe if they study abroad. Anyway, after visiting the garden, we went to Café Clock, a popular café in Marrakech where they serve camel burgers. I ordered toasted couscous with roasted chicken and raisins, and it was one of the best meals I’ve had here. After we got back to Rabat, we went to a sushi restaurant for dinner, and it was really good. I also didn’t expect to see as many sushi restaurants that I have seen in Rabat, but we all enjoyed the one we visited tonight. 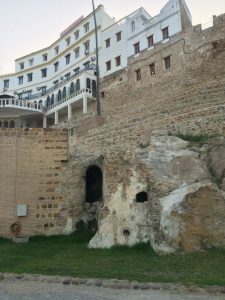 So yesterday I came back from Tangier, a city at the northern tip of Morocco. Four of the six of us decided to spend the weekend there. 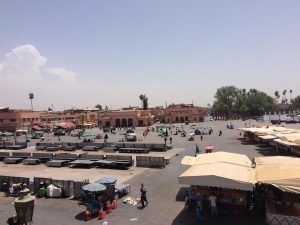 We planned to visit Marrakech, but because not all of us were able to go, we decided to save the trip for this weekend. Our train from Rabat left at 12:30 pm, and we got to Tangier at 6:30pm. The train ride was uncomfortable because there was almost no air conditioning, but for the last hour we moved to another section where it was really breezy. When we finally got there, we went to a café and after that we found our way to the hostel. However, two of us were able to stay there, and the other two had to go to a different hostel. It was my first hostel experience, and it was pretty nice. 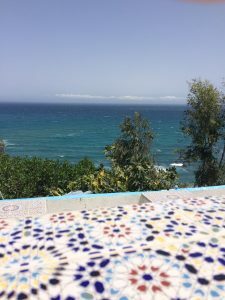 I liked the four-or-so floors of the riad, and each room didn’t have that many people (my room was for 4 people), and the terrace had a lovely view and much needed breeze. After we settled down in our hostels we met up again to hang out and didn’t get back until after midnight. I took a nap on the terrace for an hour and then I went to my bed. On Sunday, we spent almost 2 hours waiting for our food at a restaurant before leaving and going to the restaurant next door. However, I wasn’t too upset because the view was amazing, as it was overlooking the Mediterranean Sea. After that we walked around and went to the same café as the one on Saturday and got crepes! I FINALLY got a crepe here with Nutella, and the crepe was amazing. I was so happy with the texture of it, because not all crepes are made well, so I was really thrilled about it. Then we continued walking until we got to the train station to head back to Rabat. 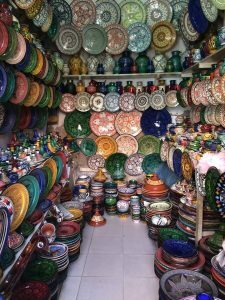 I was expecting to get hassled by a lot of vendors in Tangier, but that never happened. There were a lot of tourists and many people who spoke Spanish, so it was helpful that one of us could communicate in it, but I didn’t really know what to do there as a tourist. After the long ride back, I don’t want to admit it, but we went to McDonald’s again only because it was very close to us and most other places were already closed. When I got home, I did my homework and went to bed. Today was the first day of the second half of the program, so we have to begin thinking about making our research papers in Arabic. Also, as part of my classwork, I had to interview a few people at a café about newspapers. It was really intimidating because my Arabic pronunciation is horrible, so my teacher had to repeat everything I said to them, but I have to be ready for more activities like this. Thinking back to when I took French (I stopped after taking level 3), I never wrote a research paper, so I’m definitely weary about fulfilling this assignment, but I want to do my best on it. This post will be a lot longer because I want to post in detail about the past week. 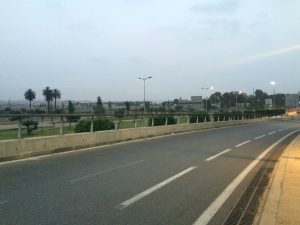 So we left for our program excursion on Saturday morning and we came back to Rabat today. 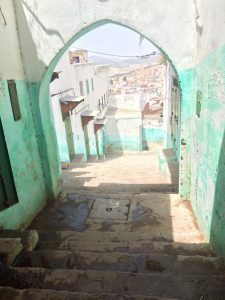 On Saturday we went to Fes, which I wrote a little bit about earlier, and we stayed at a hotel for two nights where we were lucky to have air conditioning there the whole time, since even at night it was very warm. On Monday we left for Ouazzane, where after taking a tour of the city, we had lunch and then our presentations about our community service work and the research papers we did. I talked about the increasing importance of English language learning within the Moroccan education system, as well as the initiatives and challenges around access to English education. By the way, as I was getting close to finishing my work with the NGO, two of the students drew me some pictures, and the next person to take my position is also from Washington State! Anyway, after the presentations, we left for our village homestay in the outskirts of Ouazzane. Each student was paired up with a family in the village of Bni Kolla and I was paired with a family that was made of a mother, father, 16-year-old girl and a 7-year-old boy. I was dreading the homestay because I knew there wouldn’t be any air conditioning and it would have only Turkish toilets, and even though I was right, I would stay longer if I was given the option because the family was so lovely. As soon as I met the mother and son to head to their house, the son took my hand and lead me around the farm and olive trees and kept speaking to me in Darija, to which I said in French that I didn’t understand anything and he understood me, but he would continue talking. 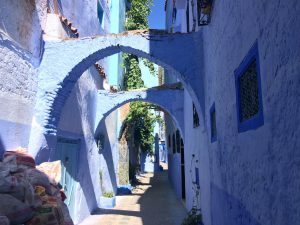 When I finally got to the house, I was greeted in the Moroccan way by the daughter (hug and a kiss on each cheek) and then in the evening I met the father with a handshake. Although the family didn’t speak English, they could speak French at the basic level (besides Arabic), so that was all I needed. I used maybe 10 words in Arabic with them, and the rest was in pretty bad French, because I couldn’t remember or I didn’t learn enough Arabic words to use with them. It was actually my first time that I used this much French since taking classes for it back in middle and high school. 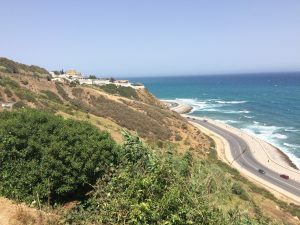 The family in Rabat is pretty nice, and I especially like my host mother, but the whole family back in the village seemed to really want me there, and I felt very welcomed. 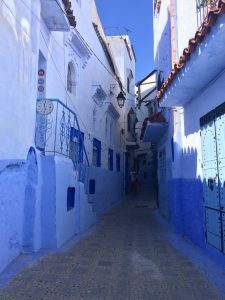 I don’t want to sound like I’m complaining about my host family in Rabat, it’s only that I felt a lot more embraced in the village, both by the family and by all the kids there. There was also another boy who was 13 who was with the family for most of the time, but we were never formally introduced, so I don’t know if he was a member of the family, or a neighbor. He tried to speak to me in French and he showed me pictures that the family had of the daughter’s engagement ceremony. Child marriage is illegal in Morocco, but it still happens, especially in rural areas, but she’s supposed to get married soon. The boy also showed me a picture book of Pennsylvania that a previous student had gifted the family, as well as a scrapbook from another student from LA. All the kids were very friendly, so we played with them outside and in the homes. My 7-year-old host brother really enjoyed playing on my phone too. I didn’t have reception there, but he was able to look through the pictures and videos I had on my phone, and the ones he repeatedly watched the most was of my brother and me. I showed him how to use the Snapchat filters, and he thought those were really fun. I also showed him and his brother or neighbor how to use my hand soap sheets, and they were really fascinated with it and the little boy kept wanting to use them, so I gave him one of my packets before I left on Wednesday. The day before we left, we had a group discussion with the villagers by having our program directors be the translators. We talked about different topics and then I asked them about the attitude towards divorce in the village, so we had a long conversation about that and how it compares with the attitude in America. 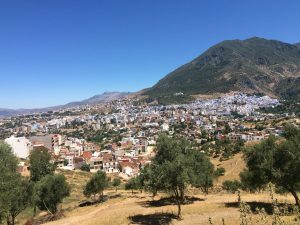 Anyway, after leaving the village homestay, we finally went to Chefchaouen! It’s a touristy city famously known for being “the blue city.” It was the place that I was most excited about and it was really beautiful. There was of course still a lot of street harassment as in the other cities, and though I’m getting more and more irritated with it, I did enjoy my time there. Unfortunately, we only stayed there for one night, but I got what I wanted from there: beautiful pictures and a dress. I actually got 2 dresses, but one dress is coming apart at the seams, so I will probably only wear it here and get rid of it. It was definitely worth the many hours of going into the shops to find the specific kind of dress that I wanted, and when I finally did, I was so happy and so in love with it. The assistant director went with me after dinner to help me find a dress, so when I found the one I liked, she bargained hard for it. 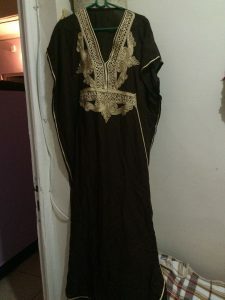 I was very impressed with her because she was very adamant with the shop keeper about how much I should buy it for, so I was able to save a good amount on it (he asked for 140 dirhams, but paid 100, which is roughly 10 USD). After we returned to the hotel, I went to see the rest of the group and I danced in my dress with them and later headed back out for a walk and returned around midnight. In the morning we had breakfast there and then drove back to Rabat. We may decide to leave for Marrakesh tomorrow, and though I’m looking forward to it, I don’t know how I’m supposed to get through the heat. During the excursion I got a bloody nose twice because of the heat, so I hope it won’t happen again. I also developed big blisters on some of my toes from my flats, but of course that won’t stop me from visiting the city and enjoying my time with the group. Today was the first day of the excursion week, and we passed through Meknes, and we are now in Fes. 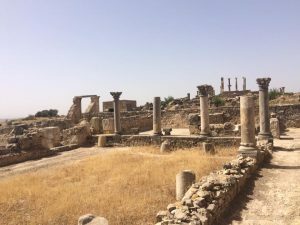 Before coming to Fes, we also stopped at the Roman ruins of Volubilis to spend an hour touring the ancient ruins. However, I had to leave halfway (or not even halfway) through the tour because I felt like I was about to pass out from the heat. It was at least 102 degrees, but I was glad to spend the rest of the time in the shade, along with some ice cream an hour later as I continued to wait for the group to return. 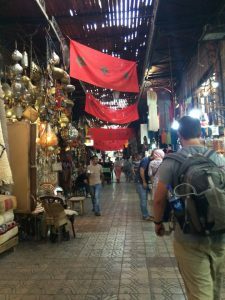 We are supposed to spend two nights at our hotel in Fes, and after that, a few other cities before going back to Rabat to our host families. Also, the forecast is terrible… it’s supposed to be extremely hot. Eid al Fitr lasts 2 days, and today was the first. The family had breakfast and then I was invited to join them to visit other family members, but I declined the offer. Of course I felt honored that she had asked me to join, but I said I couldn’t because I had to work on a paper, so I felt bad about not going and I sensed that my host mother was a bit upset about that. She still prepared lunch for me before they left. I was working on my paper for the whole day, but I didn’t have WIFI because they cut it off when they left, so I wasn’t able to get all my research done, and now I’m behind on it. At around 8pm I decided to take a nap, and I guess I accidentally deleted my essay (I also didn’t save it…oops), so I have to retype everything. At least I have the original version handwritten. Tomorrow I will have to spend the day working on my paper and then studying for my Arabic final exam. The family may have something planned again, so I won’t be able to join if they ask me to come. Anyway, a few of the group members came to my door later and we decided to find a place to eat. We weren’t sure how many places were going to be open at 10pm, but definitely not a lot. However, we found a place called Quality Burger and it was okay. It’s pretty cool how you make your order though. You have to come up to a computer and pick what you want, you get a receipt, and then you take it to the register and they get everything for you. 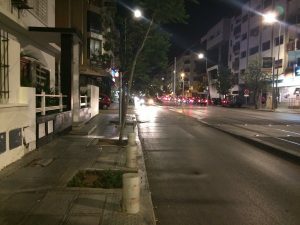 Then as we headed back home by taking 2 different taxis, the streets were virtually empty (at 12am). During Ramadan they would be filled with people, so it felt eerie walking through the quiet and empty medina, which is basically a maze of alleys. 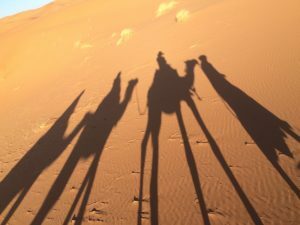 We decided as a group to go to the Sahara Desert over the weekend. The drive was incredibly long. It took about 15 hours to get there and another 15 to get back. We went so far east that we were about 50km from Algeria! 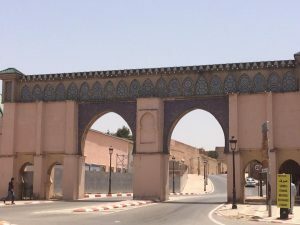 Along the way we stopped at different cities, and one of them was Ouarzazate to visit the Atlas Corporation Studios where some Hollywood movies were filmed. 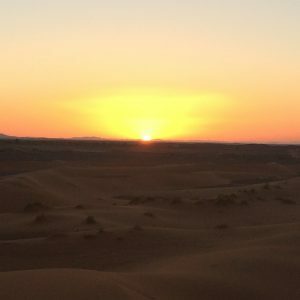 After a few more stops we arrived at the Sahara just in time to watch the sunset from the top of a sand dune. It was also my first time to ride a camel! It was very uncomfortable, but still a great experience. The highlight of visiting the Sahara was getting to lie down on a sand dune in the middle of the night and look up at the starry night. It is a rare opportunity to be in a large open space with such clear visibility, so it was even more special. This week my volunteer program ends, which I feel a bit sad about because it has been fun teaching English to my students. I appreciate their passion to learn and I will have to figure out how to spend the last two days of class with them. 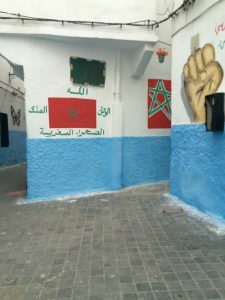 I am also looking forward to seeing the difference of Morocco during Ramadan and how it is afterwards, as Aid Al Fitr (celebration to signify the end of Ramadan) is this week. I had my first quiz on Friday and I did surprisingly better than I thought, but I have to wait to receive the grade on Monday. 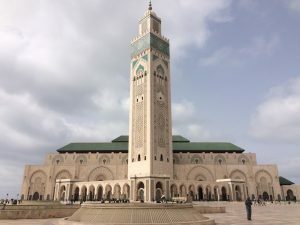 Today my group and I went to Casablanca to see the Hassan II Mosque, and then we went to the beach. After that, we checked out the Medina (old square) of the city and tried to find a restaurant to go to for ftour/iftar, but most of them were closed. We ended up splitting up to go to KFC and McDonalds near the train station. Even though these are American food chains, I was still curious about the menus. Although I didn’t go into KFC (and never have back home), the menu at McDonalds was nothing different, except that it was halal. I’ve also been dizzy for the past few days and I really hope it’s only dehydration, so I’ve been trying to drink more water. I think a part of it can be that I’m not getting enough rest and enough fresh air. 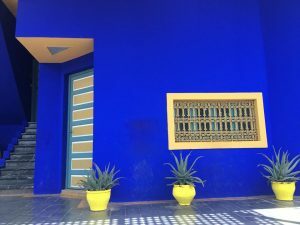 I live in a riad, so my host family lives above another family, but because both families live in a riad, we hear everything from the bottom floor since there isn’t a wall or ceiling that keeps out the noise. On my homestay questionnaire, I said I was not okay with little kids, but the family below has around 5. I wake up every few hours because of all the noise or because it gets really hot in my room since I have to close it to keep out the cigarette smoke from the host father. I intend to ask him on Sunday to not smoke in the house because I’m very sensitive to chemical smells, and I think it’s partly why I get dizzy so much. At least I get my own room. Yesterday was my first day at the NGO that I have to volunteer for to teach English. So far I enjoy it more than I thought I would because I have 2 students that I work with. One is 9 and the other is 10 years old and both of them have a strong basic knowledge of English. I’ve been using some French with them when I have to explain, and then try to translate it to English, and I’m still surprised by how much I’ve had to use it, even though my ability is pretty weak. I am supposed to get to the NGO by myself, so of course I had trouble getting there the first time and I was an hour and a half late, but today there wasn’t any problem. I still have to cross a lot of streets, and I don’t think I will ever stop feeling nervous about that. 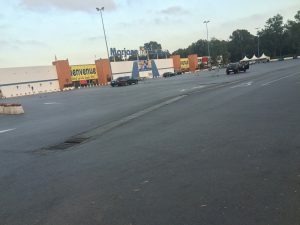 Anyway, after I volunteered and then had my Arabic class, I decided to go with a group member to Marjane, but within our group we call it the Moroccan Walmart. Instead of returning an hour later, we got home 4 hours later because there were no taxis going in our direction. In fact, there were very few cars at all, since it was around ftour. We ended up walking the whole way back, so now we must finally start homework and I’m worried about the quiz I have on Friday because I still don’t have the whole alphabet memorized. Overall, I’m feeling pretty overwhelmed with what I have to know for the quiz and by the fact that it feels like there are too many things to do during the program than what I have time for. Every night I have been falling asleep doing homework and I feel tired all the time. I hope to manage my time better. Today was my second day of staying with my host family. They are pretty cool and they are able to speak English, which is very comforting to me, considering that I still only know a few words in Arabic. They live in a traditional Moroccan house, which is called a riad. The family is made up of a mother, father, 25 or so years-old daughter and the mother’s niece who is 18. Today was also my second day of Arabic class. I have to study Moroccan Arabic, called Darija, as well as standard Arabic, called Fus’ha. Both are difficult for me because it’s hard to get the alphabet and pronunciation. I have also ended up using the little French that I remember from high school, so I regret not brushing up on that before coming here. After class I came home and I hung out with the mother in the kitchen as she prepared for ftour (Darija)/ iftar (Fus’ha), or the breaking of fast. 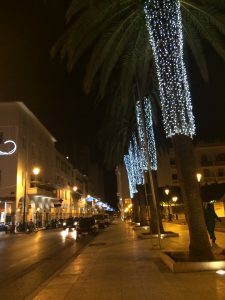 After we had dinner, I left to join my group and venture out into another part of Rabat, a rather sophisticated section. We took the tram, which is a train, and it goes through the city relatively fast. I will have to take it to the NGO starting Monday that I was matched with for the community service project. Something that makes me nervous about being here is crossing the streets, because they are wide, so I try to walk with a pace, even though I think I’m the only one in the group who gets this nervous. Sometimes I just walk with them without looking ahead. Oh well.